“Every time I walked the waterfront, I saw it as a bit of a disaster. I could see what was wrong and what could be right,” said Adrian Rowland, a coastal engineer and West Vancouver resident. West Vancouver’s urban shoreline is a mixture of sandy beaches, rocky shores, grassy parks, seaside trails and luxury homes. Much of its expansive waterfront has been altered by development over the last 100 years. With these changes, the foreshore became less accessible for residents, less ecologically diverse and more vulnerable to storms. What could you do to reduce your ecological footprint or enhance the environment at work? If you’re not sure how to get started, the experience of Beverly Olds, a portfolio director with the Government of Canada who helps oversee the Alaska Highway in northeast British Columbia, offers insight. The Alaska Highway winds past small communities, over rushing rivers and through stunning landscapes. It’s a lifeline that must be safe and accessible for drivers, but that doesn't prevent Olds and her colleagues from also supporting the wildlife traversing it, the watercourses passing under it and the people living along it. Olds portfolio includes an 11-year, multi-million-dollar highway maintenance contract. "We chose to make sustainability something that bidders are scored on. We're maintaining a highway, so it's not what you think of first when you think of sustainability," said Beverly Olds. Olds shows us that any role, even one that involves overseeing asphalt, oil and road salt, can improve its relationship with the environment. Here are four steps to start greening your work, whether you're in policy development, infrastructure management, human resources, or any other area. Your first order of business is to get buy-in and funding for your greening. If your green action provides benefits beyond the environment, you'll be in a better position to garner support from your boss, colleagues and the community. "One thing that helped us get funding was presenting the project as an integrated package," said Olds. For example, they proposed restoring habitat with indigenous plants and supporting economic development by making best efforts to hire local First Nations companies to do as much of the work as possible, including the planting. If you tackle green action from many angles related to your role—i.e. stimulate the local economy, reduce the risk from extreme weather, enhance job satisfaction—then you can leverage those benefits to gain support for your greening efforts. Sustainability thrives in and relies on collaboration. And to collaborate, we need to see things from the perspective of our colleagues, bosses and community. Olds, for one, has to rely heavily on technical experts. "I'm not an engineer or operations manager; I'm an economist. I have a strategic partnership with my operations manager and the engineering staff. The big challenge [when it comes to green action] is giving strategic direction when you're not the subject matter expert, and the subject matter expert can keep saying no to you," said Olds. · What core thing is this person trying to do every day? · What concerns will they have (i.e., safety, costs or efficacy)? · How can this eco-action help them do a better job? If you focus your eco-efforts on issues that aren't central to your work role, such as participating on an office "green team," you can’t as easily leverage your time, expertise or funding, and sticking with your commitments will get harder as you get busy. Olds and her colleagues use maintenance contracts, infrastructure replacement contracts and funding streams to scale and embed green action into their work. Revising contracts, procurement protocols or work processes to include sustainability principles. Revising job descriptions and team roles to include sustainability language and responsibilities. Revising external policies and legislation overseen by your department or ministry. Brainstorming a list of tools that you could use to leverage your day-to-day action is an effective step as you start greening your role. Your action doesn't have to be perfect from the beginning. "Plow trucks head out every morning and do pretty big loops," said Olds. But she wonders whether it is necessary to physically patrol the highway to investigate conditions. Her maintenance colleagues argue that this is the only way to ensure the route is safe. However, while that's currently true because of spotty satellite reception, the technology is changing very rapidly. "Each year, the contractor is to let us know how they’ll continually monitor the road condition. Because if at sometime they can put weather sensors every 10 km because the sensors have gotten very cheap, then rock on," said Olds. The lesson: don't let perfection slow you down; instead, adopt continual improvement as a principle. The environment doesn't have to be a "when I have time" add-on to your already heavy workload. Like Olds and her team, you too can integrate sustainability into your daily responsibilities if you look at the benefits beyond the environment, consider multiple viewpoints, come up with many avenues to include sustainability, and make a plan to constantly improve. It’s challenging to find like-minded colleagues who share your passion for the environment in a sea of status quo. When my kids started kindergarten I was keen to connect with other parents who share my environmental values. I thought this would save me from lamenting rising gas prices on the playground, getting odd looks when I bring my own plate to the school barbeque and explaining our ‘no presents but your presence’ birthday parties. And hey I figured when I was ready to start a green initiative at the school I’d be set for supporters. Being an observer, I watched for cues from kids and parents to see who might be a good fit. I eyed the girl eating bulk dried fruit and stalked her parents to identify their transportation preferences. When I saw bike helmets and mud-splattered legs I knew I’d found new friends. Maybe you’d rather not practice the slightly creepy act of stalking your co-workers to uncover how they commute or what they eat for lunch? Instead, use nature as a conversation catalyst. Dr. Steve Schein, author of A New Psychology for Sustainability Leadership, interviewed sustainability leaders to understand why they care about leaving the world better than they found it. A common theme was that leaders had spent time in nature, often as kids. I’ve found a similar connection. When I ask people why sustainability is important to them they often begin by talking about spending their childhood in nature and that they continue to value getting outside regularly. Talk to your colleagues about their summer vacations and what they did on the weekend. When you find stories of beach walks, mountain hikes or lazy days on the water you’ve revealed a potential ally. Finding the time to have these conversations between meetings, deadlines and managing your team can be tricky. Instead, you need to carve out time to have deeper conversations with your team members, other managers or senior staff. If there’s a nature trail or two close to your workplace start a weekly lunchtime walk. Madeline Sloan, Sustainability and Wellness Coordinator at Lorna Vanderhaege Health Solutions, recently started a weekly lunchtime nature walk with her co-workers. “Convening and engaging in and with nature is refreshing for your mind-body-soul, and doing it together builds community within your organization,“ said Sloan. She found that the benefits of nature walks with colleagues goes beyond building relationships. Sloan's sentiment that spending time in nature is good for our body and mind is backed up by research. For example, researchers in Japan studied 280 participants across 24 forests and found that a 15-minute forest walk lowered their cortisol (a stress hormone) along with their pulse rate and blood pressure. Walking in a concrete urban environment didn't have the same effect. There’s more and more research to support the benefits of time in nature to your productivity, mental well-being and physical health. The Nature Principle by Richard Louv offers a wealth of information and inspiration. Conversations are easier when they happen consistently and without distraction. I can’t promise you won’t talk about gas prices but over the weeks I hope you'll develop a rapport and begin to support each other as you make a difference. Put up a sign and post to your internal mailing list that this week, at lunch, you’ll be walking in nature. I really enjoyed Work Like Nature: Sustainability Lessons From Ecosystems For Your Job Or Business by Lea Elliott – it’s a perfect companion to those green initiatives you’ve been dreaming up for your workplace! Lea pairs information with action, providing exercises at the end of each chapter for you to really focus in on the learnings, and take actual steps towards greening your business and life. Click here to read more. Do you want to build a business that thrives like a forest? If you do, sign up for Lea's new course! Biomimicry for Business 1.0: How Can Your Business Profit From 3.8 Million Years of Evolution? If sustainability is a positive force then why is it so hard to figure out? In this workshop, we’ll use nature as our sustainability sage. We’ll apply the principles of prosperous ecosystems to your business challenges, risks, and environmental impacts. You’ll leave with practical ideas for green action uniquely tailored to your business and enhanced with biomimicry. This workshop is for C-suite executives and operations staff who want to build a business that thrives like a forest. Sustainability in nature isn’t an afterthought. It’s integrated into the fabric of life. Healthy ecosystems use natural resources effectively, benefit from mutually beneficial relationships, are resilient to disturbance, don’t pollute their communities and flourish year after year. Why should your business be any different? Weaving sustainability into your company can inspire your staff, support your community and grow your business. Click here to learn more. Registration deadline is October 4th, 2017. Do you aspire to green your brand? Be forewarned: It’s challenging, as Kerri McKenzie and her colleagues discovered. McKenzie researched, developed and sourced materials for the outdoor gear retailer Mountain Equipment Co-op (MEC) at its head office in Vancouver. Four lessons from her experience can help you green your supply chain with more reward than headache. Click here to read the rest of the post at Thriving Vancouver. A dark green, forested hillside frames Crannóg Ales, a farmhouse brewery in British Columbia, Canada. Douglas fir trees dot the forest, with brown trunks too big to reach your arms around. The ground is littered with soft, moist brown fir cones twice the size of a hop cone. The fir cones are both the trees' growth strategy and food for the squirrels. The trees defy gravity by carrying water and nutrients up their trunk without a pump. The soil, composed of tree needles and fallen branches, stores rainwater for the trees to use when they need it. 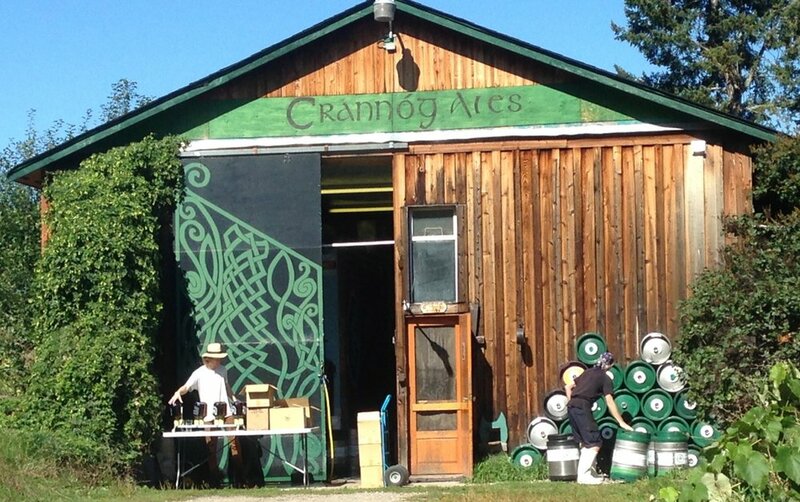 Next door to the forest, Brian MacIsaac, co-owner of Crannóg Ales, approaches brewing like a fir tree. Click here to read the rest of the article. Click below to listen to Lea's radio interview with Michael Thomas, host of The Greenpreneur Show in Chicago.